I was asked by Anthio-Ofo (when you are done here check out her wonderful blog but not b4 you’re done reading here lol) if the 2 point rotation was fuller than the 3 point which she is using. Since I’ve only done this once on about 3/4 in new growth it’s kinda hard to tell visually. I just took a pick of the top of my head and compared it with the last pic I took of the top back in January using the 4 point. I’m pretty sure the January pic was after retightening and 1 wash whereas the left pic is after retightening & 2 washes. In both pics I have spritzed daily. Y’all see any difference? Yes I just posted something about this on my blog. IMHO even though they may look the same in my case they sure didnt feel the same. My hair was constantly bunching up at the roots when I was using the 2pt and I found I was rotationg more often then required. 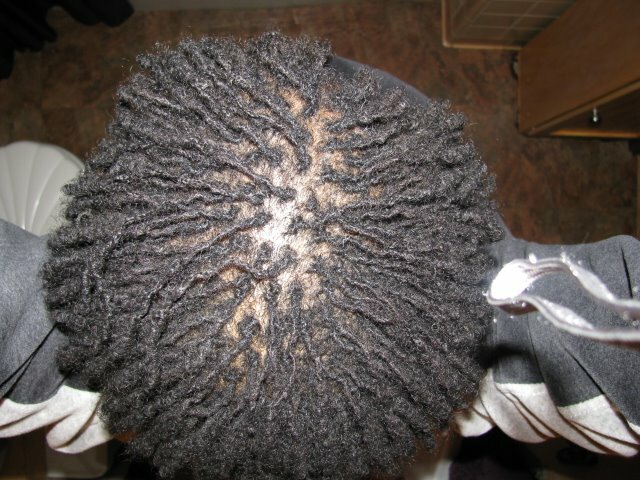 When I switch to 4 points the hair felt denser and I had a lot less holes in my locs. I have really soft curly hair so maybe this is a big deal for me. Some people I guess do well with only 2pt rotations then keep on but for myself I need to do 3-4 pt rotations. 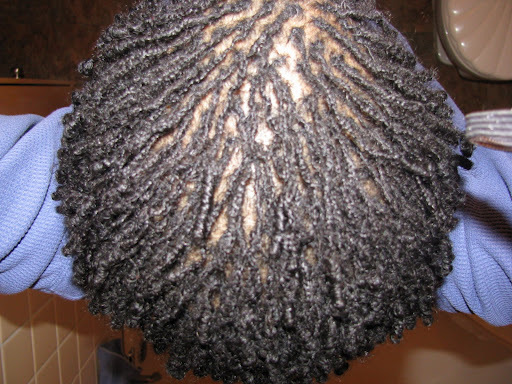 Nice locs by the way I enjoy following your journey. I can’t tell the difference between the two pics. When I tried the 2 pt rotation on my hairline, it didn’t feel tight enough. I had a little bit of loose roots left, so I did one more rotation. Should the tightened parts feel firm, or could they feel a little loose and squishy? I would like to keep some of my roots loose after retightening but not if it means having thinner locs in the long run. Thanks Natigurl. Since my 8 month update is coming up in a few days and I’ve had time to observe my hair from the last re-tightening. I’m gonna post my results in that update. M*Shawnte, the earlier retightenings are firm. I would say leave just a little bit of new growth since you want some of your roots loose. As I replied back to Naturigurl, since I’ve had 3 weeks now to the day when I finished my last re-ti I’ve had time to look at my locs. Check back Thursday or Friday for my 8 month update post. I’ll address it there.